Nature is defined by Symmetrical Balance. Symmetry is found at the heart of much of the universe. In flowers, in men, in animals, and in space symmetry reigns. "The universe is built on a plan the profound symmetry of which is somehow present in the inner structure of our intellect." The heart of man yearns for this order in the world, and Symmetry smiles as she soothes that yearning through nature. Symmetry can be thought of as an image in a mirror. Two objects, exactly alike. These objects are reversed, yet cannot be separated. They exist to imitate one another. One without the other is no longer symmetrical. Such is the principle of symmetrical balance. Symmetry cannot exist where its exact opposite does not. How do we use this universal principle of order and design to create exquisite gardens? If we use an urn on one side of a wall, we duplicate it exactly on the other side, the same distance from the vertical axis (or center) of our edges. It is nearly that simple. I’d like to dive a bit more into our definition of symmetry however, as there are some very important concepts that will help us to begin to understand how to use symmetry in our landscapes. Symmetry is a powerful tool in our arsenal of design principles. Three basic concepts can add dimension to our understanding of symmetry and allow us to begin to translate that understanding into our gardens. What we’ve touched on above is the full definition of symmetry. However, while symmetry is at the core of the universal design, symmetry in nature is not exclusive. In fact, as humans, we must strive heroically to create perfect symmetry. So it is good to recognize one very important fact as we discuss symmetrical balance. Not all balance is achieved through perfect symmetry. 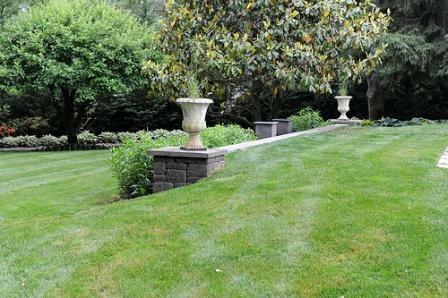 In fact, asymmetrical balance is often used in conjunction with symmetrical balance in most garden settings. In addition, not all situations allow for perfect symmetry. This is where approximate symmetry saves the day! Most garden situations rely on approximate symmetry to create a sense of balance. What does approximate symmetry mean? 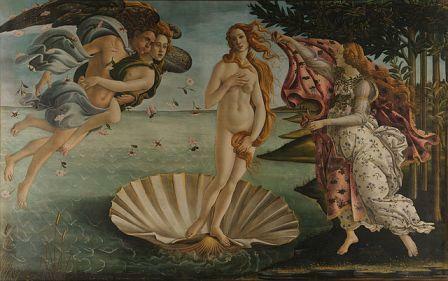 Take a look at this painting by Sandro Botticelli. Here we see the concept of approximate symmetry in action. While this painting appears somewhat symmetrical in nature, it is nowhere near perfect symmetry. Its symmetry is a sense of general symmetry, similar objects on both sides of the composition, with a vertical center axis. Symmetrically balanced right? As a composition, it is essentially symmetrical. Yet it is not the same on both sides of the vertical axis. On one side of the composition is an angel flying who is carrying a woman as if to land. On the other side of the composition is only one woman, but with a flowing garment in her hands as if to cover the nakedness of the woman in the center of the image. The visual mass of the angel on the left and the women on the right is roughly equal. Thus, this image would be said to possess the characteristic of approximate symmetry. 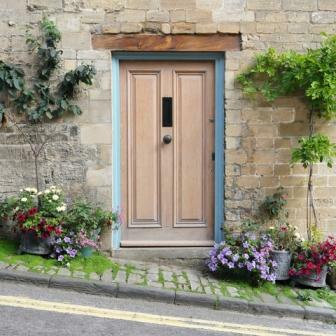 To illustrate the power of approximate symmetry in the garden, here is a charming photo depicting the use of approximate symmetry to frame a door on a steep street. The composition appears symmetrically balanced though all the elements that make it up are not identical in any way. The tree on the right is taller than the tree on the left, and the composition of the containers at the foot of the door is different but of similar visual mass. Even the flowers are arranged slightly differently from one side to the other. Yet the overall impression is of order and symmetry. The lesson in this is that balance does not really mean perfect symmetry in most gardens. 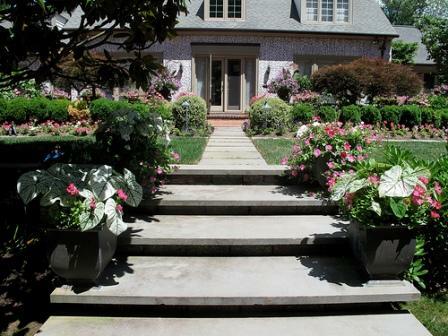 Nearly every garden situation requires slight adjustment of the design elements to create a symmetrical balance. Bilateral Symmetry is a term that is used to describe near perfect symmetry. 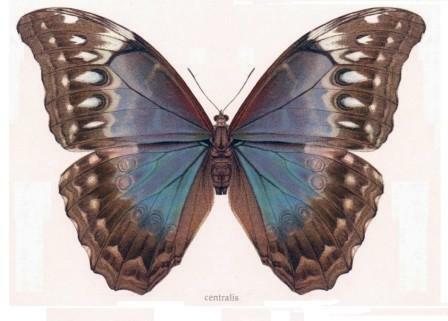 As in the drawing of a butterfly below, both sides are essentially the same but reversed. This is possible to achieve in the garden under some circumstances. In most cases, in the garden, bilateral symmetry is used to create a more formal setting, as the sense of order and balance created by the use of bilateral symmetry is essential to a more formal setting. This near perfect symmetry is difficult to achieve upon any garden plane that is not reasonably flat and already possesses a potential for symmetrical balance. An example of such a situation would be when a front yard area was already equally balanced on both sides of a nearly symmetrical house. There are many other situations that inherently have a symmetrical balance and provide opportunity to create a showcase garden that is balanced. 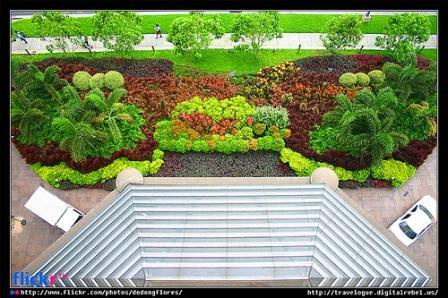 The garden pictured here is symmetrically balanced due to the use of bilateral symmetry. 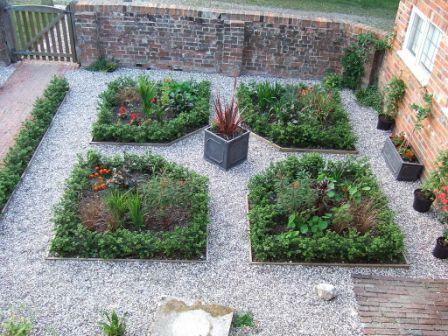 Smaller garden beds are also good candidates for the use of bilateral symmetry to create a balance. Parterre Gardens such as the one pictured here are another example of bilateral symmetry. Radial Symmetry is another concept that is worth exploring in our quest to create balance. This concept is useful for formal and informal gardens alike. Radial balance is created by using similar elements which radiate from a center point in all directions. 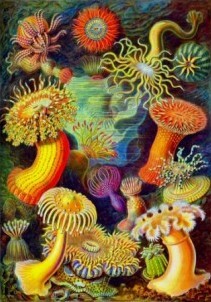 The public domain image below by Ernst Haeckel, demonstrates this concept. Note that the elements of this composition are not the same, yet the colors, general shapes, curves, and forms are repeated throughout, providing this image with a sense of symmetrical balance. Some astoundingly beautiful effects can be created using radial balance in your garden designs. This garden at Villa Carlotta near Lake Como in Italy is an exquisite example of a formally treated garden that relies exclusively on radial symmetry to create symmetrical balance. 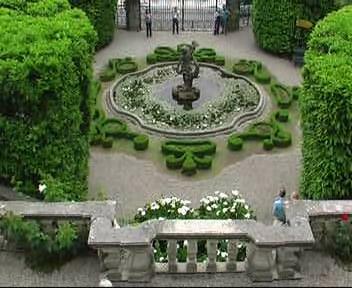 Does the arrangement of the Villa Carlotta garden above look familiar to you? Go back and look at the examples for bilateral symmetry! What about that parterre garden? Does it demonstrate radial symmetry? The answer is yes. Why bother mentioning that? It is important to remember that all of the concepts above represent discussions of symmetrical balance. Each garden may contain elements of all three symmetrical balance concepts. Or a garden may be entirely dependent upon asymmetry. These are all just useful concepts to help you organize your garden spatially. They are not formulas for success. Take a moment to review the photos on this page. We have been talking about symmetrical balance. I would like you to note that in no photo on this page is there a “perfect symmetry”. All of the photos on this page have the characteristics of symmetrical balance, but none of them demonstrate perfect symmetry. There is a lesson in this that I want to again re-iterate. In fact, in most cases, perfect symmetry can create a static, somewhat lifeless garden. If everything is perfectly symmetrical, there is nothing really to stop our eye, to create an “incident” for our eyes to devour. We may even pass by perfect symmetry without noticing it, as it can tend to fade into the background. We crave balance, not perfect symmetry. So don’t slavishly create a perfectly symmetrical garden and decide you are done. Somewhere, somehow, in every situation a point of emphasis must be present. This is often created by adding an element of asymmetry to a symmetrical composition. It can also be created by introducing a single element such as a door or garden entrance at the center point. Better to create a less formal approximate symmetry in your garden unless you are willing to spend countless hours outside maintaining your landscape. Not only is the occasional element of asymmetry desirable in order to create a greater visual interest, it is also much easier to maintain. anomalies that give us “interest”! The garden is the same way. Gardening is an art rooted in science. You have to get the science right to create the art, but the art is not a science! Remember that! If you’d like to learn more about symmetry, check out the Visual Balance page, where both Symmetry and Asymmetry are defined.